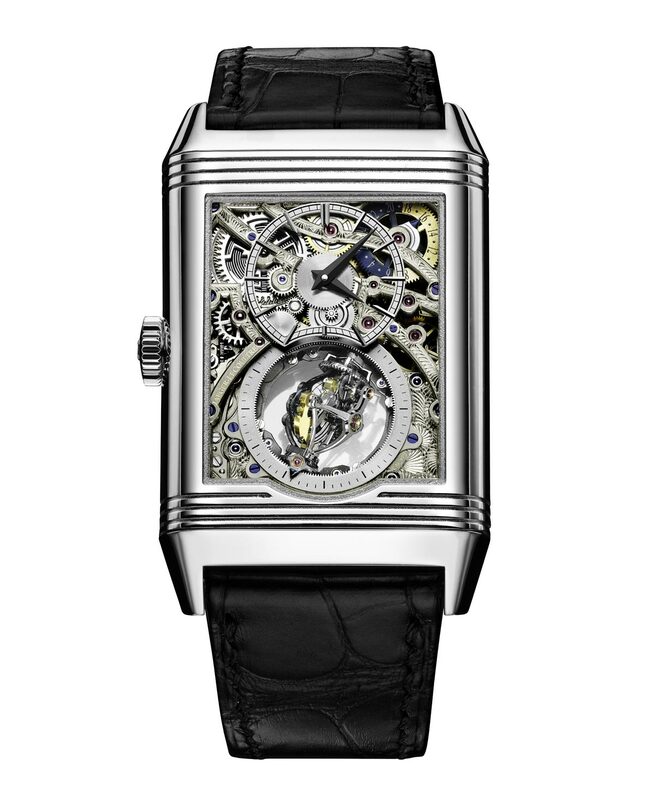 The perfect timepiece to celebrate the 85th anniversary of Jaeger-LeCoultre's most iconic watch, the Reverso Tribute Gyrotourbillon is a true masterpiece, one of those timepieces that make you completely forget about time once they catch your eyes. 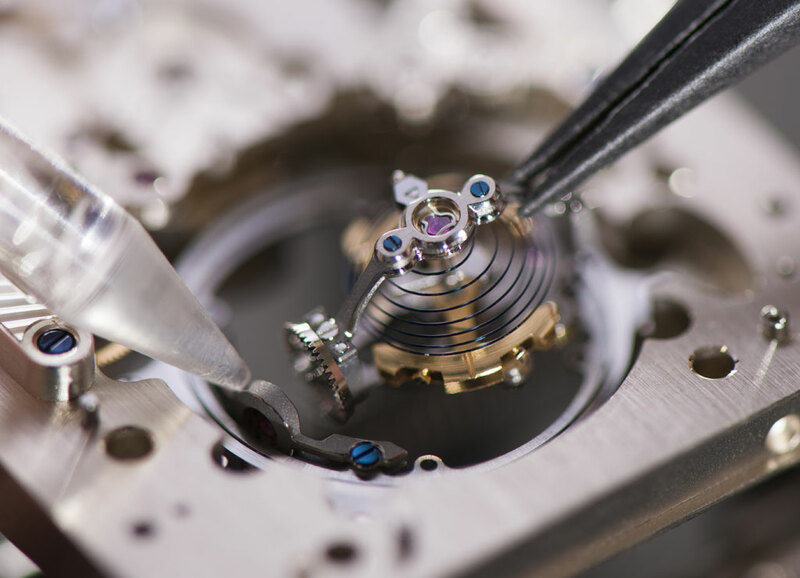 Equipped with the Jaeger-LeCoultre hand-wound Calibre 179, entirely developed and produced in the Manufacture, this creation reveals an all-new Gyrotourbillon. Now performing its rotation by means of an external driving mechanism, it appears to be floating in mid-air enabling the wearer to fully enjoy its light architecture. 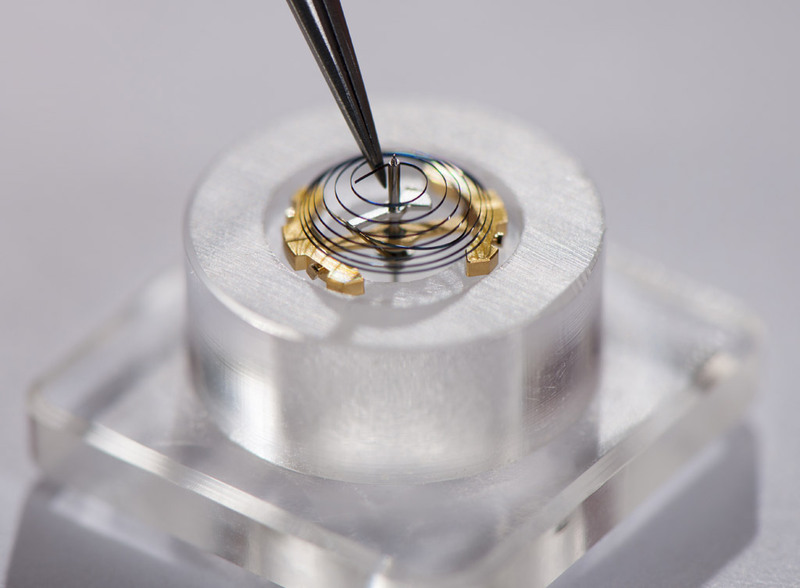 A unique approach to the highest precision, the three-dimensional development of this bi-axial flying tourbillon fascinates with the rotation speed of its two carriages performing an external rotation in one minute and an internal rotation in 12.6 seconds. 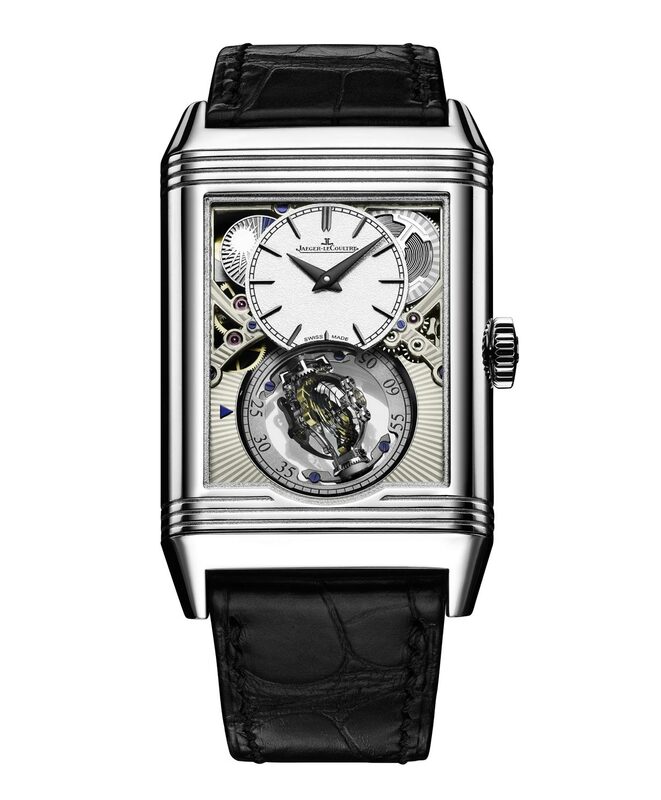 Oscillating at a frequency of 3 Hz (21,600 vph), the movement is composed of 385 parts and offers a power reserve of 40 hours. The distinctive balance-spring, with its hemispherical shape, is by itself a demonstration of rare technical mastery, just like the Gyrolab balance-wheel, distinguished by a non-circular configuration that considerably reduces air friction. Shaped like the Jaeger-LeCoultre anchor symbol, this component enhances considerably the watch’s precision. 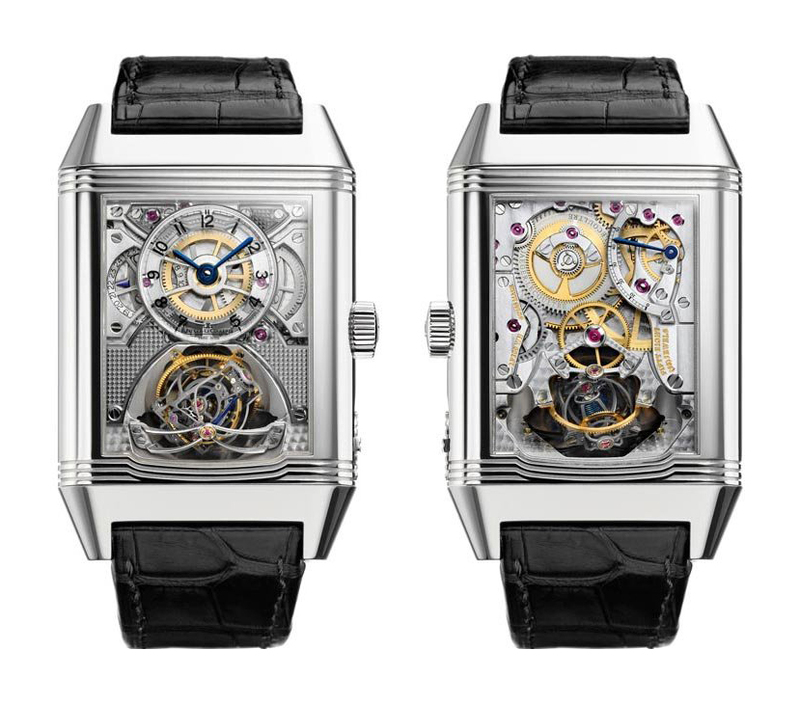 Compared to the Reverso Gyrotourbillon 2 introduced in 2008, the Reverso Tribute Gyrotourbillon is around 30% smaller in terms of both width and thickness. Crafted from platinum, the new case is 51.1 mm x 31 mm with a thickness of 12.4 mm. Considering the level of complication of this timepiece, this is an exceptional achievement for Jaeger-LeCoultre's watchmakers. 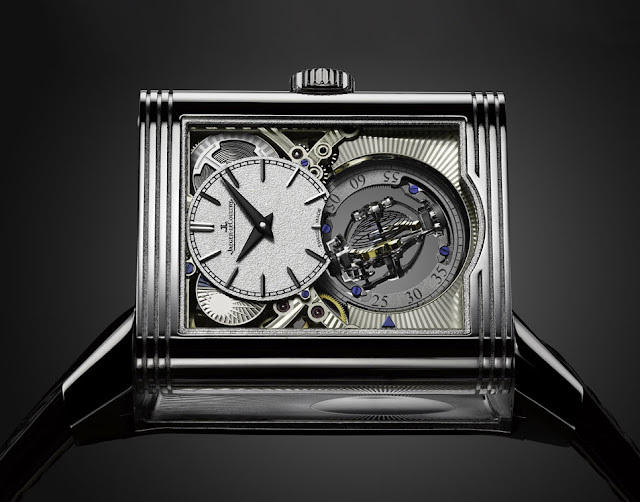 The front face features a finely grained white round dial swept over by blued steel Dauphine-type hands with a day/night indicator at 11 o’clock and an unusual display of the passing seconds by means of a graduated disc rotating at the cadence of the Gyrotourbillon, with a small blue arrow placed on its left to read off this indication. A hand-crafted sunburst guilloché pattern frames the tourbillon. 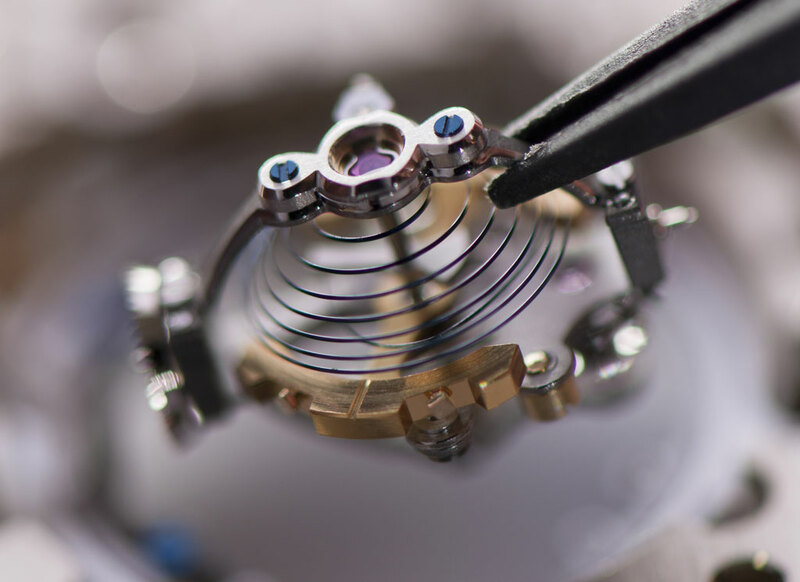 The other face of the Reverso Tribute Gyrotourbillon demonstrates the art of the Manufacture’s engravers that finely hand-decorated the bridges of the openworked movement. Displaying a second time zone, this side also carries a day/night indicator in 24-hour mode at 2 o’clock as well as a small seconds hand driven by the tourbillon. 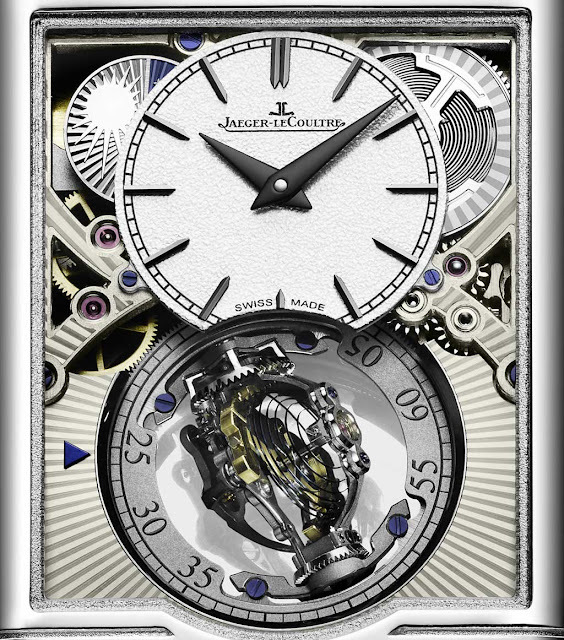 Swivelling the case reveals a cradle that is gently curved to follow the shape of the wrist. This area, adorned with a sunburst guilloché motif, leaves a small round, smoothly polished surface just below the position of the Gyortourbillon to enhance the view of the show performed by this complication when the case is fitted inside its cradle. 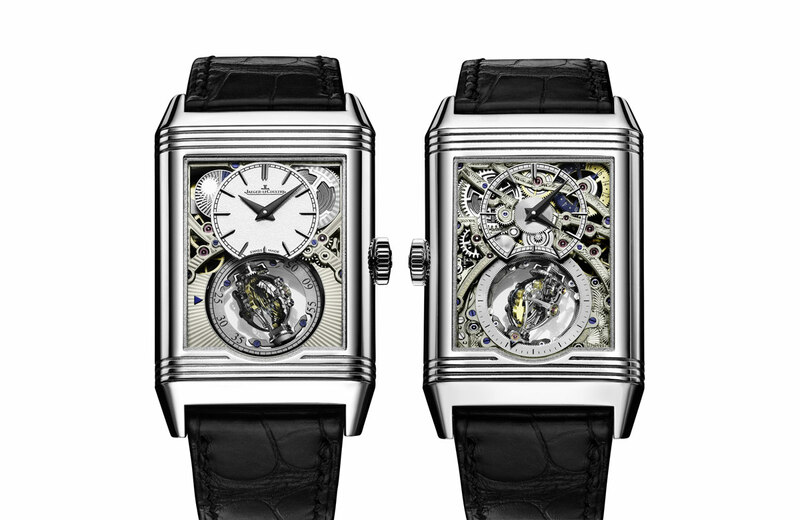 The gyrotourbillon (the first one) was the watch that attracted me to the world of watchmaking. 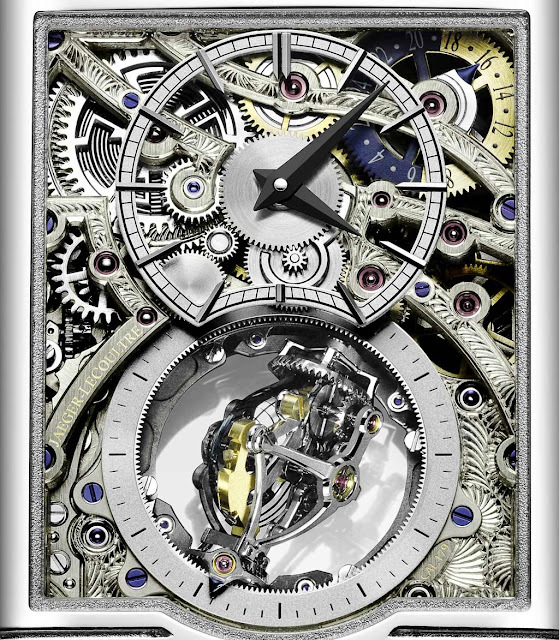 Those who create these kind of watches are artists. 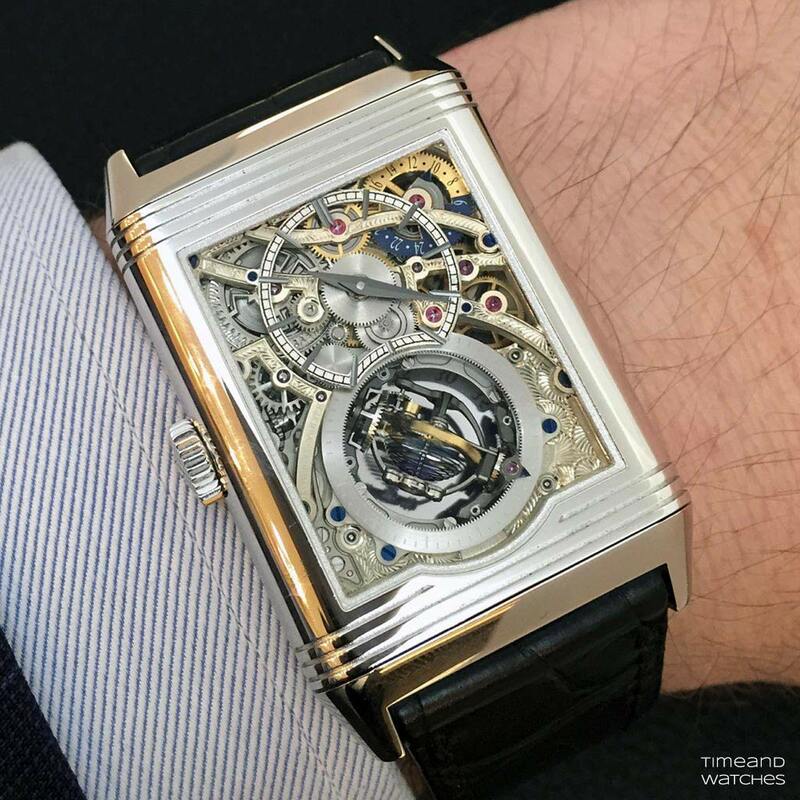 SIHH 2016: Jaeger-LeCoultre Reverso Tribute Gyrotourbillon. 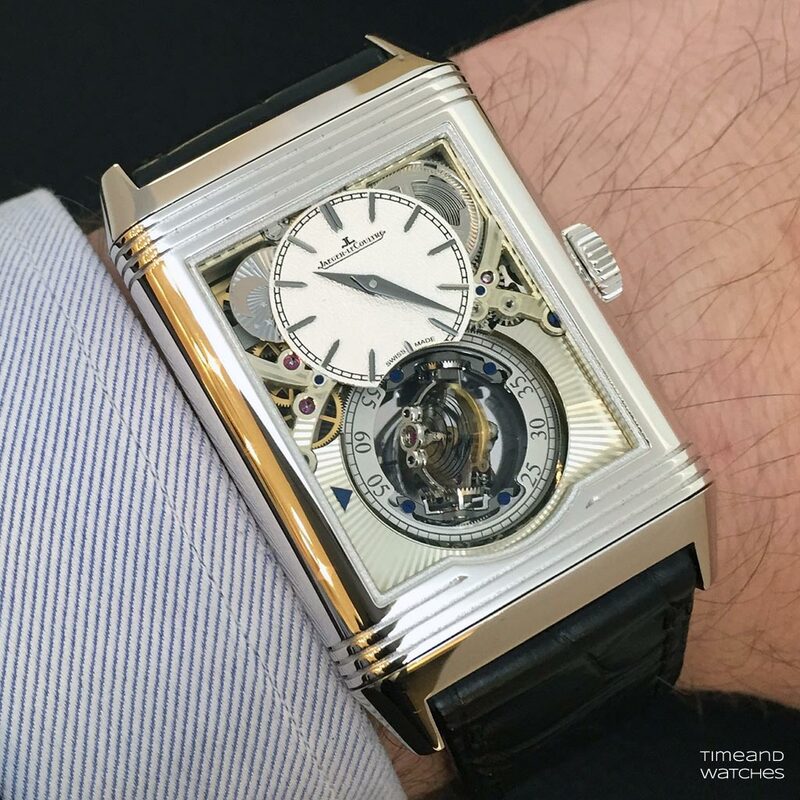 The perfect timepiece to celebrate the 85th anniversary of Jaeger-LeCoultre's most iconic watch, the Reverso Tribute Gyrotourbillon is a true masterpiece, one of those timepieces that makes you completely forget about time when they catch your eyes. The Reverso Tribute Gyrotourbillon is a limited edition of 75 pieces with a price of Euro 270,000 before taxes.